In the turbulent last years of the Second World War and its aftermath, William Herbert ‘Stumpy’ Turner came to Princes Park from inner-suburban West Melbourne to win two Premierships with the Old Dark Navy Blues. Quick, elusive, durable and courageous, he was sharp around the goals and rarely hampered by injury. He preferred to use his middle name, but was better known as ‘Stumpy’ because of his diminutive 170 cm frame. 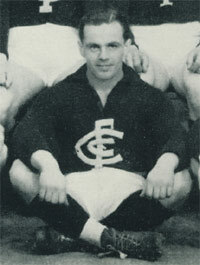 Turner was 22 years old on debut in 1944, and by the following season had established himself in a rapidly improving Carlton team under the inspirational leadership of captain Bob Chitty. The Blues made the 1945 finals in fourth place, three wins and 25 percentage points behind hot flag favourites South Melbourne. Stirring wins over North Melbourne and Collingwood then followed, to earn the Blues the right to challenge the Bloods in a Grand Final showdown. Turner lined up on a wing in that infamous September day, less than a month after Japan had formally surrendered to the Allied forces. ‘Stumpy’s’ opponent was Ted Whitfield, who, along with Bob Chitty, was one of the main instigators in a clash forever remembered as the ‘Bloodbath’ Grand Final. Carlton won a vicious, spiteful match (and our seventh VFL flag) by almost five goals, while a total of ten players were reported. Recriminations and controversy over on-field violence raged for years afterward. Carlton slipped to sixth place on the ladder in 1946, but bounced back into flag calculations in 1947. Led by the brilliance of new captain Ern Henfry in the centre and Bert Deacon at centre half-back, the Blues topped the ladder after the home and away rounds, then firmed as favourites for another flag with a solid 13-point victory over Essendon in the second Semi-Final. Sharing the roving duties with Jack Conley, Turner was among the Blues best with four clever goals. As expected, Essendon’s Preliminary Final victory over a plucky Fitzroy set up another Blues – Bombers flag decider. The ‘Dons hard road to the Grand Final was strewn with injured players, but they put up an epic struggle on Grand Final day. In the first minutes, Turner’s clever snap shot from the boundary brought up full points in the first of his many possessions, while Essendon’s early inaccuracy in front of goal was to cost them dearly. With ten minutes to play, Essendon led by twelve points when Carlton launched a last-ditch bid for glory. Sparked by Ken Baxter in the ruck (who had come off the reserve bench in place of the injured Bert Deacon) the Blues hammered the Essendon defence to narrow the gap to just five points inside the final minute. Dominating the centre, Henfry took the ball in space and kicked long to centre half-forward, where Baxter crashed the pack. The ball spilt to Carlton’s Fred Stafford, who snap-kicked perhaps the most famous individual goal in our history from 25 metres. As was the norm for those times, Carlton’s second Premiership triumph in three seasons brought a hangover in 1948. The Blues again faded to sixth, though Turner had another solid year. He didn’t miss a match, and banged through 27 goals to further enhance his reputation for consistency. Continuing the pattern of rise and fall, Carlton won eight of our first nine games in 1949 and finished the home and away rounds in second place on the ladder behind a resurgent North Melbourne. North had thrashed Carlton by 56 points on the eve of the finals, but Carlton - strengthened by the return from injury of Jack Howell, and inspirationally led by Ern Henfry – kicked six goals to three in the last quarter of the second Semi-Final to beat the Shinboners by 12 points. That win – one of our club’s finest – booked another Grand Final berth against Essendon. On a perfect spring day in Melbourne, 20,000 people were waiting when the MCG gates were opened. Eventually, more than 90,000 crammed in to see the Bombers – with John Coleman dominant at full-forward – prove too good for Carlton in a torrid, physical Grand Final. Turner and Jim Mooring roved to a losing ruck for the Blues on a day when both were overshadowed by Essendon’s champion Bill Hutchison. That third Grand Final appearance was to be his last in the Navy Blue number 7 for 'Stumpy' Turner. The following year, he was lured to Glenferrie Oval by Hawthorn, and farewelled with genuine regret by all at Princes Park. He played ten senior matches for the Hawks in his last season, before retiring to concentrate his efforts on his other sporting love; cricket. Turner was born in the Bendigo suburb of Eaglehawk, in which he played for prior to moving to the West Melbourne FC. Turner passed away on the 24th Feburary, 2002 aged 80. As well as being a top footballer H. Turner was also handy with the cricket bat. H. Turner Just Misses Shield Century. Melbourne, Sun - "H. Turner, 12th man for Victoria in four previous Sheffield Shield games, and rover for Carlton Football Club, just missed a century on Saturday in a match against West Australia at the Melbourne Cricket ground. Victoria scored 364, of which Turner - the highest scorer - made 96 in 160 minutes." Contributors to this page: Jarusa , Bombasheldon , WillowBlue , blueycarlton , PatsFitztrick , molsey , pblue , p(12)terg , nikki and admin . Page last modified on Tuesday 16 of May, 2017 18:00:35 AEST by Jarusa. 1996 - The Kouta Conundrum (03/07/96). 1995 Prelim. Final - Brad Pearce snaps for goal.